This exhibition, Doug Aitken’s first comprised solely of photographs, renders plain the LA-based artist’s sustained investigation of social space and dislocated time. The twenty-five landscape and aerial shots on view span nearly a decade and are easily ordered by themes such as “horizon,” “illumination,” and “flight,” categories that allow for an almost-seamless thematic exchange between instances of culture and nature or the urban and the organic. Entering the gallery, viewers first encounter nighttrain, 2004, a mirrored C-print of a nighttime cityscape that settles at the bottom of the frame like a resting moth, its wings speckled by light. 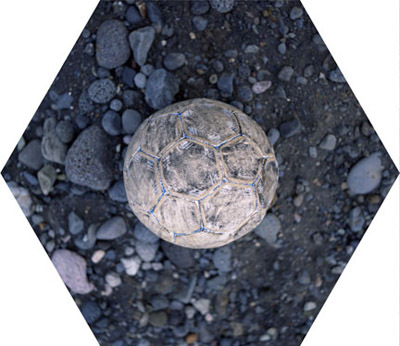 Population one, 2004, assumes a hexagonal shape, a modular unit that is echoed in the soccer ball at the work’s center. Given Aitken’s celebrated video practice, each photograph begs to be defined by cinematic parameters. Although many of the works were produced while completing video projects, Aitken develops an autonomous formal framing (for example, by underscoring the difference in texture between film grain and pixelation) to distinguish his photographs. Consequently the images slip away from set filmic notions like “film still” and “on location” to propose hypothetical mise-en-scènes that deliberately abandon the stories and circumstances that constructed them. This is well illustrated by conspiracy, 1998, a sequential work formed by four aerial shots that depicts a tight circle of figures set against a white void; each is captured from a different distance. This simple, quiet cycle documents a Situationist-inspired icebreaker that Aitken orchestrated in an Alps snowfield in order to reconnect a group of estranged French art students. By intentionally withholding such subplot or backstory, Aitken shrewdly thwarts not only narrative but also weighty conceptualism.